This ensemble illustrates fashionable formal dress for men in the 1770s. The fine silk velvet indicates that it was probably worn during the evening, at the theatre, opera or the always convivial Assembly Rooms located in the more fashionable towns and cities. 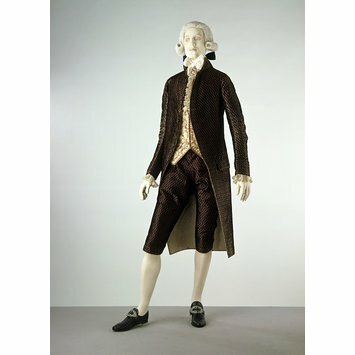 This type of dark-coloured cut velvet was popular for formal evening dress in the 1790s. It was also used for Court dress, when lavishly embroidered. 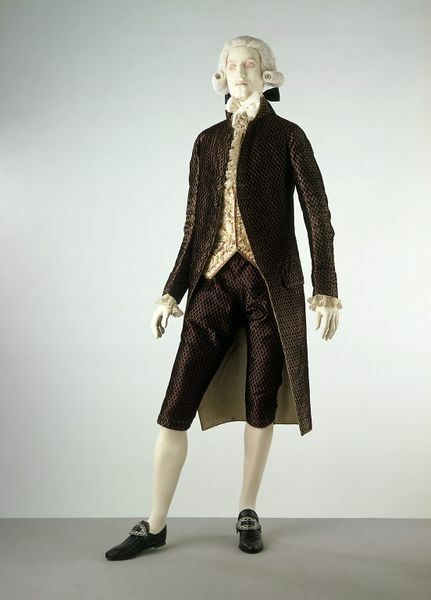 As befits the conservative nature of evening dress, the style of this suit is similar to day-wear in the 1780s, although by the 1790s even formal wear had a high turn-down collar.